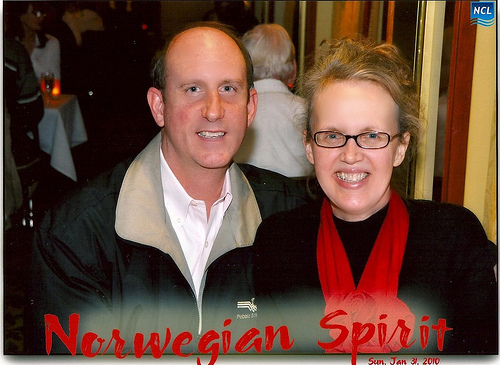 On January 31, Tim and I boarded the Norwegian Spirit in New Orleans and embarked on our first cruise. Although we enjoy traveling and have several friends who cruise on a regular basis, we just didn't know if cruising was for us. We came really close to trying it out when we celebrated our 25th wedding anniversary in August, 2006. We talked with a travel agent who specialized in Alaskan cruises and considered booking one. However, in the end, we flew to Anchorage, rented a motor home and spent two weeks driving around seeing some of the beauty of Alaska. We had a great time and just didn't think we would have enjoyed a cruise as much. However, a cruise to a warm spot in the middle of winter did have a certain appeal to us. 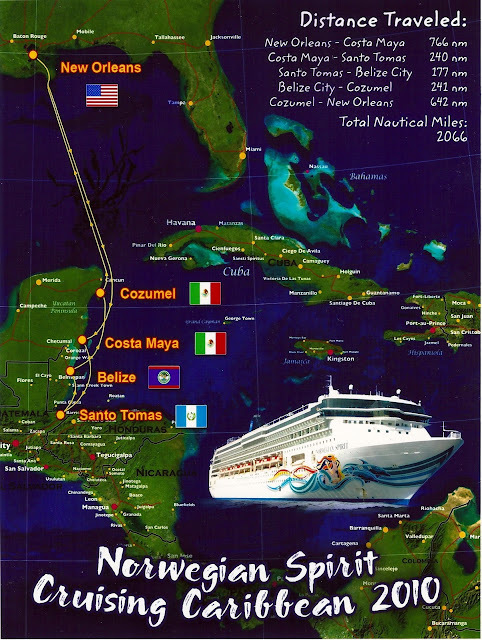 On January 1st of this year, I got online and looked at cruise specials for February. A southern girl, I don't have a high tolerance for the cold. By February, generally our coldest month, I am so ready for some warmth and sunshine. February 1st is my birthday, and I thought it would be nice to spend it in a warmer location. As it turned out, I found what looked like some great deals. 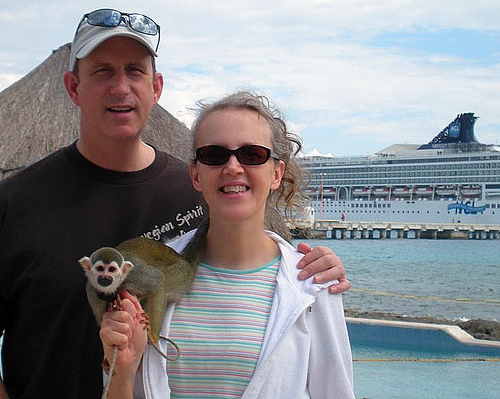 I consulted with Mardot; she and her husband, Joel, have been on a number of cruises, and she assured me that the cruise I had in mind was an excellent value. Tim said, "Book it, Honey!" And the planning began. Mardot turned out to be my personal cruise advisor. She sent me a number of texts with cruise tips, things she wished they had known on their first cruise. I copied and pasted them to my notebook on my iphone. By the time we were ready to depart, I had a virtual booklet. I told Mardot she should write a book, "Cruising for Dummies." The tips were all helpful and made our trip more enjoyable. 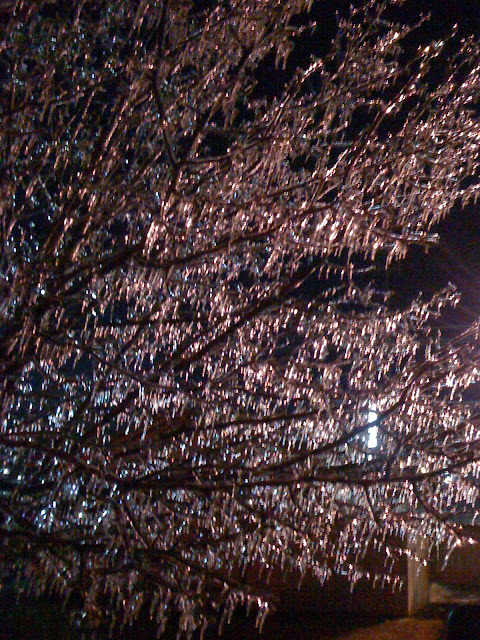 Central Arkansas got an ice storm before we left home. Then a little snow on top. We get excited about snow here because we generally get so little. Here's Tim feeding the birds in our yard before we left. Although the ice had started melting off by the time we departed Little Rock, there was still a quite a bit of it on the roads. I was glad when we got a little farther south where the roads were clear. Even at that point, we noticed the trees were still coated with ice. Here's a tree in Pine Bluff at a catfish restaurant where we ate. It was cold in N'awlins! The passengers boarding the ship were dressed in just about every conceivable manner. Some looked like they had already arrived in the tropics with their lightweight clothing, bare legs, and sandals. Others were bundled up against the cold. We fell into the second group. 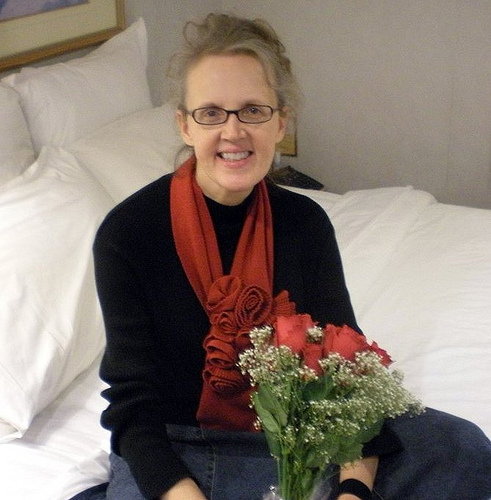 My Sweet Baby bought roses for me at dinner the first night on the ship. The next morning we donned lightweight clothing and headed to the top deck to eat and to explore the ship. It was windy up there! And chilly! I decided to change into something warmer until we reached our first port of call the next day. Since this day was to be spent at sea and it was my birthday after all, I indulged in a hot stone massage, a fire and ice manicure, and a fire and ice pedicure in the spa. What a treat! I began to think I might like this cruising thing after all. Meanwhile Tim worked out in the gym. This cute little fellow greeted us when we returned to our cabin at some point that day. In the evening we had dinner at the French restaurant. Tim, always so thoughtful, had requested a special birthday cake for me. The waitstaff at this restaurant were extra special. Our waitress that night (on the right in the picture below) regaled us with stories of life in Colombia. I don't think it's a place I want to visit. There were 70-something nationalities represented among the employees on the ship. These people spend up to ten months of the year away from their families while working on the ship. They have one day off each week while in port. Another half day on embarkation day. One lady working in the buffet restaurant was looking forward to getting home soon to see her little girl. I enjoyed hearing some of the unusual names of the staff. The young lady who brought the roses to our table the first evening was Perpetual; she was from India. The girl who did my massage was Gemma. The young lady from Jamaica who did my manicure and pedicure was Sunny. Another sweet young lady in the spa was Tutaro. On the second morning, we awoke to sunny skies, blue seas, and the sight of another cruise ship along ours pulling into port at Costa Maya, Mexico. Time to get off the ship! We relaxed while we waited for our shore excursion to begin. And had our picture made with this squirrel monkey. He was so cute. It was so good to see my Sweet Baby relax. He works so hard. We had booked a dune buggy beach safari. Tim was excited; he envisioned an adventurous drive over large sandy dunes. I was a bit hesitant about this adventure, mainly because I have been on some wild rides with Tim. The wilder the better as far as he's concerned. But, that's another story for another time. The fact that it was a safari type tour with guides reassured me that the ride probably wouldn't be so wild that I couldn't handle it. Our guides, Omar and Adrian, were enthusiastic and fun. They wanted to be sure all of us had a good time. The dune buggies were painted in bright, tropical colors. The pink one in front of us was my favorite color. Tim was raring to go! At the first stop Adrian used a machete to prepare fresh coconuts for us to drink from. The coconut milk was delicious - and refreshing! Later, at our main stop, they scooped out the coconut meat for us to eat. Poor Tim only got a small piece. I hogged it - it was that good! There was a neat little outdoor bar where we bought cold water. The bright sun was hot! Omar explained that this area had been ravaged by a major hurricane three years ago. It sounded like he said "Hurricane Tim," but because of his accent we couldn't be sure. We got a laugh out of that! 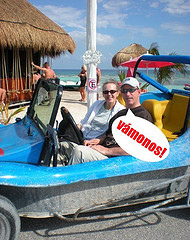 Our main stop was at a beach resort where we enjoyed a tasty snack: fresh fruit, salsa with chips, and rice and beans. One of the ladies behind the counter had a parrot perched on her shoulder. 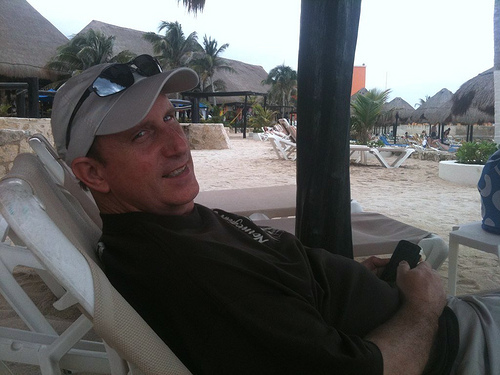 Tim and I took a walk along the beach and then enjoyed a little siesta. The view from my hammock - ahhh . . . . Blue skies, sunshine, and gently waving palm trees - in February! We saw a monkey somewhere along the way. Some of the sights outside of the village of Mahahual, just outside Costa Maya. A curious little observer. We saw so many precious children on this cruise. I wanted to scoop them up and bring them home with me. After our adventure, we returned to our balcony where we watched the sun set as we departed Costa Maya. We just thought that was an adventurous day! If we only knew what awaited us upon our arrival in Guatamala the following morning . . . . I know that's right, girlfriend! It looks like you had a blast! SO will you be cruising again? I'd love to see that picture, Brit! I thought that swing was so neat! Susan-- I finally figured out how to leave a comment! LOL! I kept tying to hit the 'Contact us' tab & I always got this message: "Could not perform operation because the default mail client is not properly installed." Finally -- I put my cursor on 4 comments at the bottom! What can I say -- I'm so slow with this stuff! LOL! Are we going to get to see some pics from Guatamala & the rest? Girl - you are so gonna love exploring Hawaii! Kerri, Guatamala is coming up. I have a draft in progress. Oh my, now THAT was an adventure! That is so cool, Brit! I thought those swings were such neat "barstools.". Thanks for sending this!